What we saw in the case of Che Taylor was police officers acting as judge, jury and executioner. COLDBLOODED killing. That’s how I referred to the death of Che Taylor last February at the hands of the Seattle Police Department. Almost a whole year after the shooting, King County finally is holding an inquest to examine the facts surrounding Taylor’s death. An eight-member jury will decide whether or not the police officers’ deadly use of force was justifiable. Che Taylor should not have been killed that February afternoon. As the inquest gets under way, I’m looking for the truth. The Seattle Police Department has been hiding behind a smoke screen since Taylor’s death. The so-called facts they’ve shared with the media simply don’t line up. The only evidence we’ve seen of the gun that police said was on Taylor at the time of the shooting is a photo of a black handgun sitting on a table. That gun was later traced back to a former King County sheriff’s deputy, which raises a series of additional questions. I would be lying if I said I wasn’t suspicious about how the gun turned up. I have a very hard time believing that it was ever in Taylor’s possession. Additional evidence is needed to confirm SPD’s story. To make matters worse, after the officers shot Taylor not once, but multiple times, he lay motionless on the ground for seven minutes before someone attempted to administer CPR. About four minutes after the shooting, police officers felt the need to handcuff him, despite the fact that he had already been shot multiple times. It took another three whole minutes before someone thought to give him CPR. Growing up, we are told that our police force is supposed to protect us; their job is to keep people safe. Yet far too many black people in Seattle and across the country tell a different story. The police force, we would argue, is more concerned about protecting property than our bodies. What we saw in the case of Che Taylor was police officers acting as judge, jury and executioner. That is a dangerous combination, and it’s not how our justice system is supposed to work. Even if Taylor was breaking the law, he should have been arrested, jailed and allowed due process in a court of law. Immediately after the shooting, the police released information about Taylor’s criminal background, creating a media narrative, suggesting that it was somehow his fault he was shot multiple times in the back. What they failed to mention is that Taylor had done his time. That he was a loving husband, brother and son. That his family was his world, and he was so happy to be home. Let me be frank. Taylor’s prior criminal convictions had no relation to what we saw unfold that afternoon. The police released information about Taylor’s background to cover up the gaping holes that existed in their version of the story, hoping it would taint public opinion of Taylor. It was a calculated and manipulative move. The department should have known better since it is currently under the watch of the U.S. Justice Department. 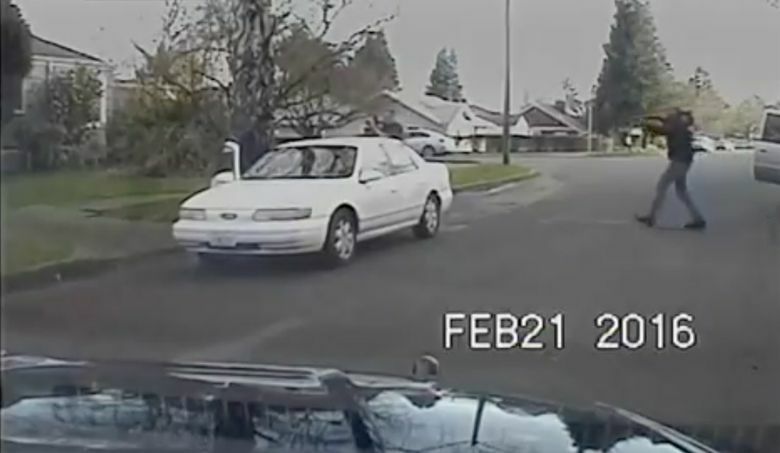 I don’t know about you, but when I watched the police dashcam video, all I saw was a man trying to obey an officer’s orders to put his hands up and get on the ground. So why was he shot? Why did they shoot him so many times? Why was he handcuffed after he’d been shot multiple times and lay motionless, posing no immediate threat? Why was he allowed to lay bleeding on the ground for seven long minutes before someone tried to help him? It’s time for answers. The department needs to prove that what those officers did was justifiable, and from where I sit, all I see are lies and thinly veiled attempts to cover the truth. The question is, does anybody care? Or will the inquest jury sweep this under the rug and blame it on Taylor’s background or some other excuse? Gerald Hankerson is president of the Seattle King County NAACP. He is a community leader passionate about criminal-justice reform, economic justice and empowering youth.